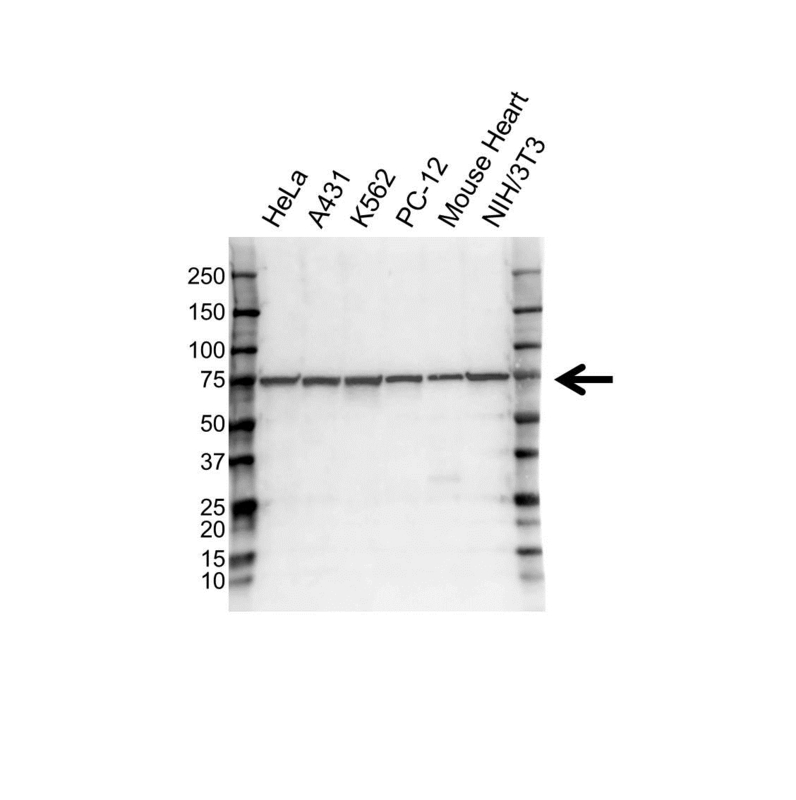 Western blot analysis of whole cell lysates probed with Hsc70 antibody (VMA00600) followed by detection with Goat anti Human IgG F(ab')2:HRP (1/2,500, STAR126) and visualized on the ChemiDoc MP with 1 second exposure. Arrow points to Hsc70 (molecular weight 73 kDa). Hsc70 antibody recognizes heat shock protein family A (Hsp70) member 8 also known as LPS-associated protein 1, N-myristoyltransferase inhibitor protein 71, constitutive heat shock protein 70 or heat shock cognate protein 54. Human anti Human Hsc70 antibody recognizes the heat shock protein family A (Hsp70) member 8 also known as LPS-associated protein 1, N-myristoyltransferase inhibitor protein 71, constitutive heat shock protein 70 or heat shock cognate protein 54. This gene encodes a member of the heat shock protein 70 family, which contains both heat-inducible and constitutively expressed members. This protein belongs to the latter group, which are also referred to as heat-shock cognate proteins. It functions as a chaperone, and binds to nascent polypeptides to facilitate correct folding. It also functions as an ATPase in the disassembly of clathrin-coated vesicles during transport of membrane components through the cell. Alternatively spliced transcript variants encoding different isoforms have been found for this gene (provided by RefSeq, Aug 2011). Human anti Human Hsc70 antibody detects a band of 73 kDa. The antibody has been extensively validated for western blotting using whole cell lysates.